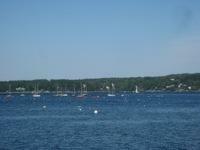 Yesterday we got up and prepared the boat to continue our trek downeast. By the time Stephanie was done making the boat shipshape and I was done resealing our port caprail the wind still hadn’t even started to whisper in to Linekin Bay. We started up the trusty diesel and headed out in search of some breeze. When we made it out of the bay however there was still no wind but there was a large swell coming in out of the South. 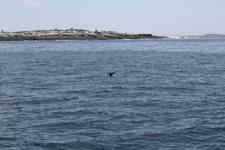 There was also a pod of dolphins leading us farther downeast. We decided to make some headway under motor power and set off for Eastern Egg Rock. 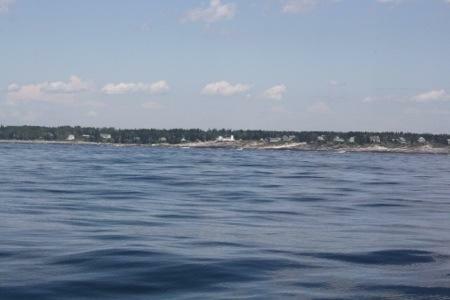 Shortly after passing the lighthouse at the northern tip of Fisherman’s island in Boothbay harbor we spotted our first of 6 six seals that we would swing by and check out Rode Trip during the day. 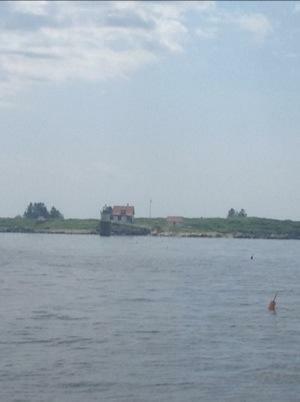 Here is the first landmark that we passed on our way east, the fort at the end of Pemaquid point. 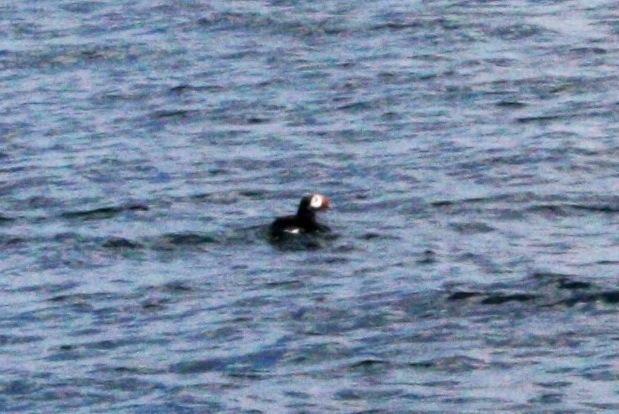 We arrived at Eastern Egg at lunchtime, and were treated to the sight of Puffins. The puffins were reintroduced to the island some time ago, and they seem to be thriving. 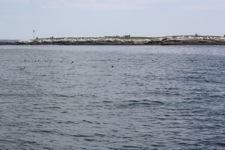 We saw several flocks of them swimming around the island. We could get a great view of them with the binoculars. Stephanie thinks that they are “cute…like panda’s…but birds”. 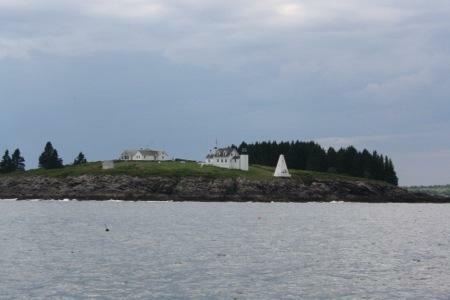 After watching them for a while we picked up a breeze and set off under sail to head out around Shark Island, and finally enter into Penobscot bay! It looked like rain was coming and the wind died again, so we fired up the engine and motored into Tenants harbor, where we are now safely at anchor in Long Cove. 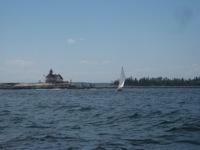 Yesterday we took a short sail around Southport Island to get out of the Sheepscot river and into the Boothbay Harbor region. 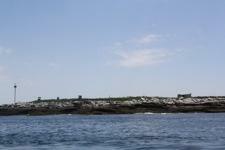 As we expected we ran into a lot of chop getting out of the Sheepscot river, but the wind was good and a close reach brought us just around the lighthouse at “The Cuckolds”, the rocks at the end of Southport Island. 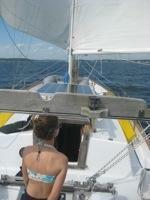 After rounding “The Cuckolds” we headed downwind, giving us an opportunity to sail “wing on wing”. This means that we had one sail flying on each side of Rode Trip. It only works when there is enough wind, and you need to head in exactly the same direction as the wind. It turned out that was the situation we were dealing with so we flew wing on wing right into Linekin Harbor. 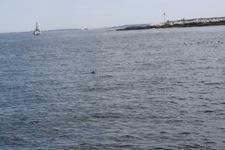 Just past the Cuckolds, we spotted two dolphins and watched them swiftly swim away. We anchored in Linekin Bay next to Emme, a fellow Seven Seas Cruising Association vessel.